Surrey based company Amazon Filters are one of Europe’s top liquid filtration system suppliers. The company, founded in 1985, required more space to cope with their growth plans, acquired another warehouse at the Albany Park Estate, Camberley, where they occupy four joining units. They needed to expand their welding bays and form additional storage areas for heavy tooling and finished goods. Having used Hampshire Mezzanine on many previous occasions they were chosen again as the main contractor for the project. Hampshire Mezzanine were able to organise all health and safety issues under a Construction Design Management (CDM) project ensuring compliance with Building Regulations at the same time. The new unit needed to be divided up and the space used for different business functions. To complete this, a full height jumbo stud wall was installed to form a welding bay area, which was to be accessed via a large rapid roll automatic door. 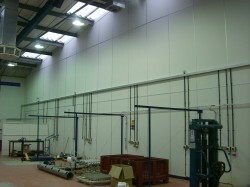 Part of the remaining area was fitted with a 150m2 new heavy-duty mezzanine floor. 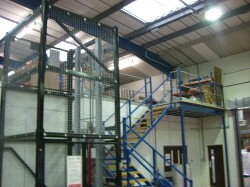 Having previously fitted two mezzanine floors for Amazon Filters, Hampshire Mezzanine understood the client’s heavy-duty loading requirements and carried out a detailed stock analysis. This ensured that the correct loading was specified, and also checked the existing buildings slab details to ensure that the floor slab could withstand the point loads of the mezzanine columns. The mezzanine floor was to be fitted with racking holding heavy tooling and was to be accessed by a new goods lift capable of lifting 750Kg pallets. The area under the mezzanine was enclosed with stud partitioning around a large cutting machine and new fluorescent lighting was installed. The new building also had the emergency lighting and fire alarm installed. “Over the years and various projects they have undertaken for us we have always found HMF to be professional and excellent at interpreting our requirements and turning them into practical and cost effective solutions to our needs. We are very happy to recommend them to anyone requiring mezzanine and other internal construction work to be done.” -Neil Pizzey, Managing Director of Amazon Filters The work that HMF completed assisted Amazon Filters to continually expand their business to world-wide customers and was completed on time and on budget over a six-week period.